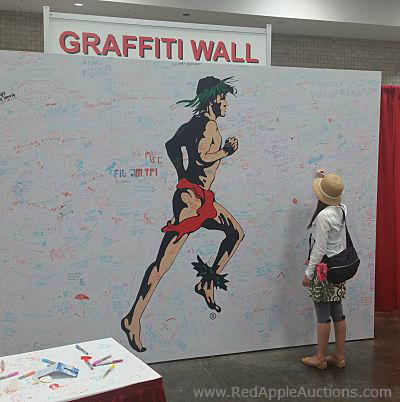 At the 2016 Honolulu Marathon trade show, attendees were encouraged to write words of support to runners on a Graffiti Wall. One of my last auctions of 2016 was in Honolulu, HI. The fundraiser coincided with two large public events — the 75th anniversary of the Pearl Harbor bombing, and the Honolulu Marathon, which is the 4th largest marathon in the United States. The marathon was scheduled to be run the day after I left, but a free trade show was taking place at the Hawaii Convention Center down the street from my hotel. One of the displays at the trade show was a Graffiti Wall. 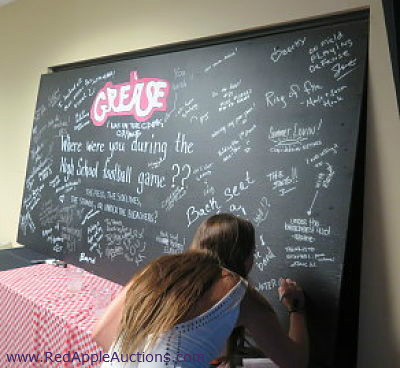 A Graffiti Wall can be incorporated into your event as a silent auction activity. What *is* a Graffiti Wall? Attendees were encouraged to post words of encouragement or thoughts about the marathon on the wall. By the end of the day, the entire wall was filled with well-wishes. Here’s how I’ve seen this concept used at benefit auctions. It made for an easy, interactive, and free activity. Unlike the Florida fundraiser, the Honolulu Marathon Graffiti Wall didn’t pose a question; the wall was blank and left for guests to write whatever they wanted. But in a benefit auction environment, I suggest using a question to engage your guests. Depending on the formality of your fundraiser, you might opt for a serious question, such as “What do your children love about XYZ school?” If that’s not your style, consider a lighthearted query, like the football game example. Tailor the question to your event and audience. With planning, the Graffiti Wall could be put on display at your headquarters, another venue, or another event. If you’ve successfully used a Graffiti Wall, please share the style of event and theme that you had in the comments below. I know other readers would love to get ideas. I’m confused? Why is this in a silent auction? Are they paying to write on the wall? No, guests aren’t paying. It’s an “activity” for guests to enjoy (if they opt to do so). It’s generally offered during the reception, which is typically when the silent auction is open for bidding. At the Florida fundraiser, the wall remained up all evening. Guests could have written on it after the dinner and live auction (when dancing began), but most people took time to jot down something during the reception. this sounds like a great idea … looking forward to hearing how anyone did this! We’ll see if anyone posts an “after” comment or photo. Thank you for your reply. Makes sense. Can you tell me where they bought that size board?